I have this phobia about steamed cakes. I think I am not the only one. I am ok with small steamed cakes, but my legs will be shivering at the thought of large ones. The fear of collapsing is not unreal, it is very deep in me. I don't fear failure, I fear wastage. I fear of having to eat the failure and forcing myself to do it rather than discarding. I was hesitant at first because I am not a big fan of Jidangao, but she was very patient and tried to encourage me. LOL. I'm glad I did try it and the cake stood tall and fluffy. Thanks dear buddy! She used a basket, but I used a pan. So, it's up to you on which to use. But it's not too well recieved. 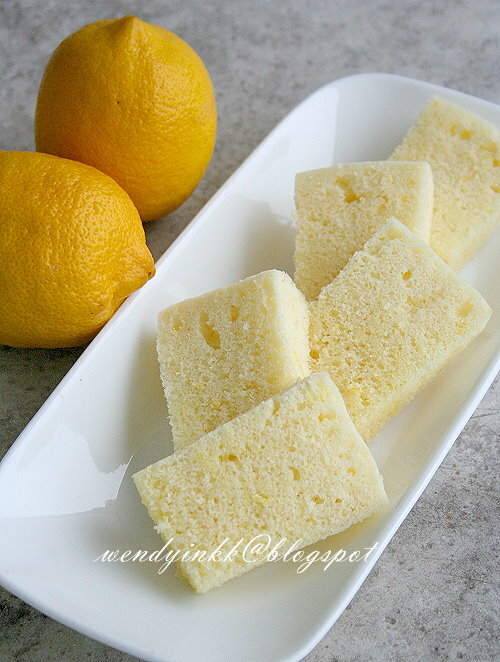 My MIL found the lemon taste weird, so did my hubby. But I love it, it's a fresh new change. So, for purists, I think it might dissapoint you, but people who are willing to accept changes, this will be nice new change. No eggy smell! 1. Sift flour+baking powder. Set aside. 2. Beat eggs and sugar until ribbon stage, thick and fluffy. 3. 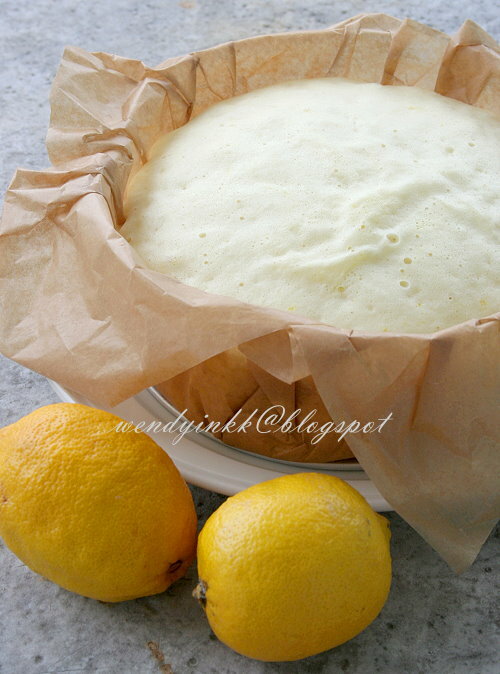 Mix oil+Lemon juice+zest, and together with the sifted flour, pour into the egg batter. Fold with hand whisk,then only fold with spatula along the sides..
4. Line a 8 inch round pan with one big piece of paper. 5. Pour the batter in and rest batter for 10 min before steaming. 6. Steam on high heat for 20-25 minutes. 7. Lift the cake from pan and cool it on the wire rack. 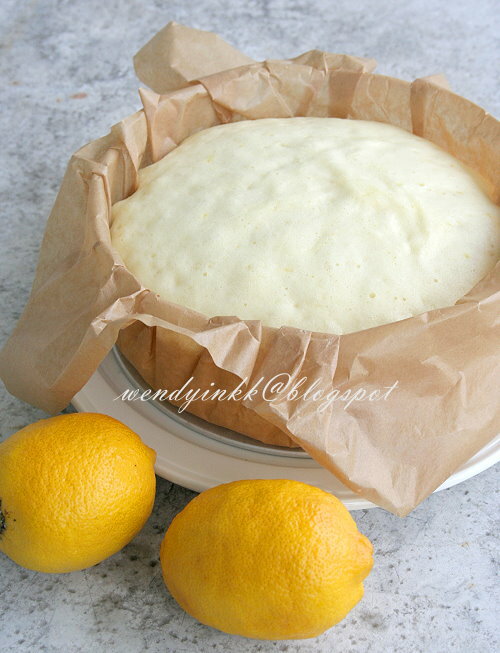 Remove paper when it's totally cooled and slice cake to serve. wahahaha i no need to wait long for this recipe! !Yeah Yeah....but i cannot understand this "Fold with hand whisk,then only fold with spatula along the sides." WOW ! Going to love making this ! 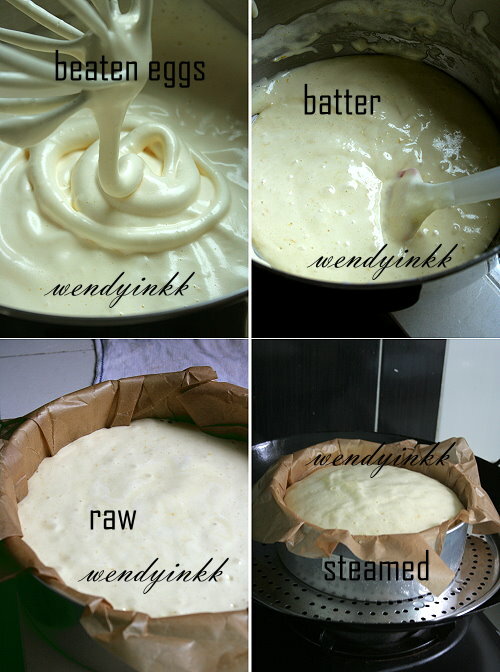 Hi Wendy, I'm one of those who feels the same about making a big steamed cake. I fear not the failure but the wastage too. Must try this to overcome the phobia..
Sure, I'll get it done when this week is through :) There'll be 3 posts from me. U do the initial folding with balloon whisk then scrape the sides with spatula. I did try another recipe after this, also fail, and I tried 3 times same recipe cos I die die dun want to believe, eat until scared! Oh, I am not alone then! Also scared to make steamed cakes. You are right, if tak jadi very sakit hati to waste ingredients. Wendy, your sponge cake looks fabulous. Such fine texture. 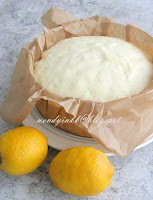 Is that wax paper you used to line the pan? Oh, I can feel the fluffiness! Looks so soft and cottony like. Some would like a change of taste but some prefer the old "Kai Tan Koh" and I am scare to taste of eggy taste and smell. Usually recipes with ovalette works better. It's non stick baking paper, that's how it's written on the packing, the picture is in "My kitchen"
I have tried jidangao so many times but til now never once succeeded. I really don't know what went wrong. Could it be the oil? I've never put any oil before. Oh and do you think if I omit the lemon and the zest, it still can come out ok? I like steamed cake very much, how many tablespoon I have to put if I want to add Pandan Emulco? yeah, so afraid of wastage and so guilty..my dogs will get to eat them :) i think some people dont like the lemon taste in steamed cakes maybe it tastes a lil sour, like taste gone bad maybe.. I bought 孟老师recipe book, did not realize has such good recipe! I never tried her recipe...can you imagine how many cook book I have? Hi... 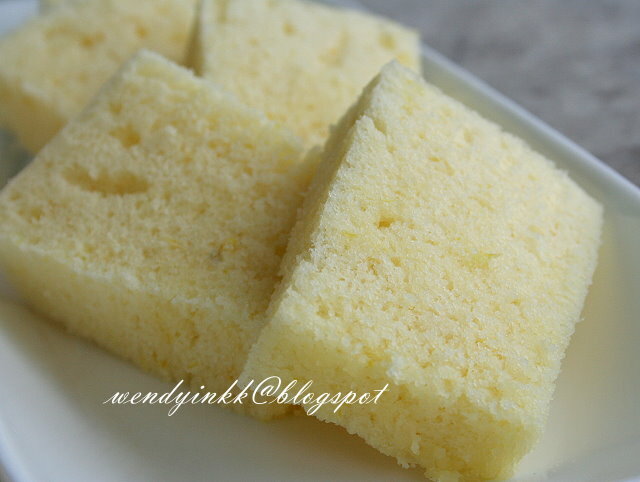 I tried many times steam sponge cake. Ended up is dry & not so soft. Can I just use normal baking tin? The egg qty is it calculate v the egg shell or just the egg? Usually such quantity for eggs are without shells, but you can safely use 5 Grade C eggs. That's what I did. hey there... i was wondering if i could try this in cupcake cases too? It's ok. You can steam those in cupcake cases for 15-20 minutes, depending on size. Any reason why rest the batter for 10mins before steaming?? Thanks. Probably to let the big air bubbles come to the surface and burst. Resting it could also allow the batter to develop some gluten and the cake will be more stable when cooked. Just a guess.